We never knew Texan beach vacations were a thing until we had one. 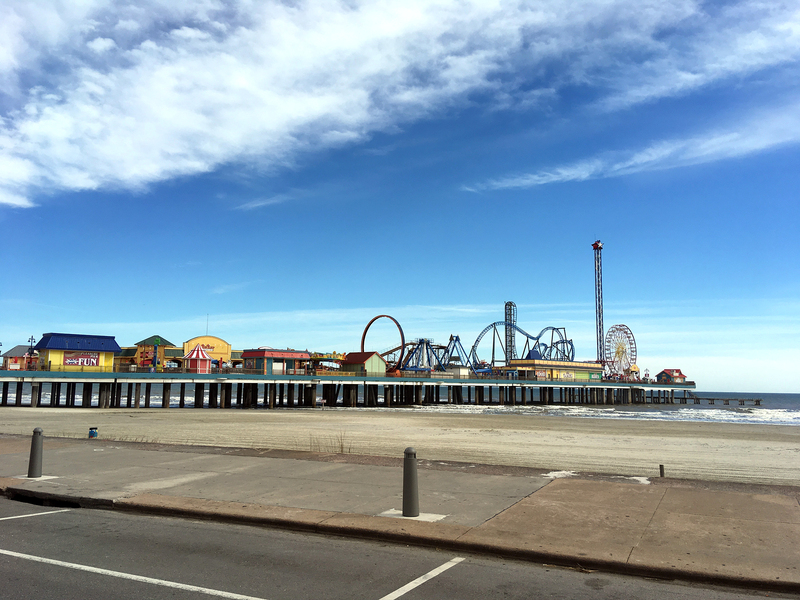 Cruising through America’s third coast in Corpus Christi and Galveston, TX. 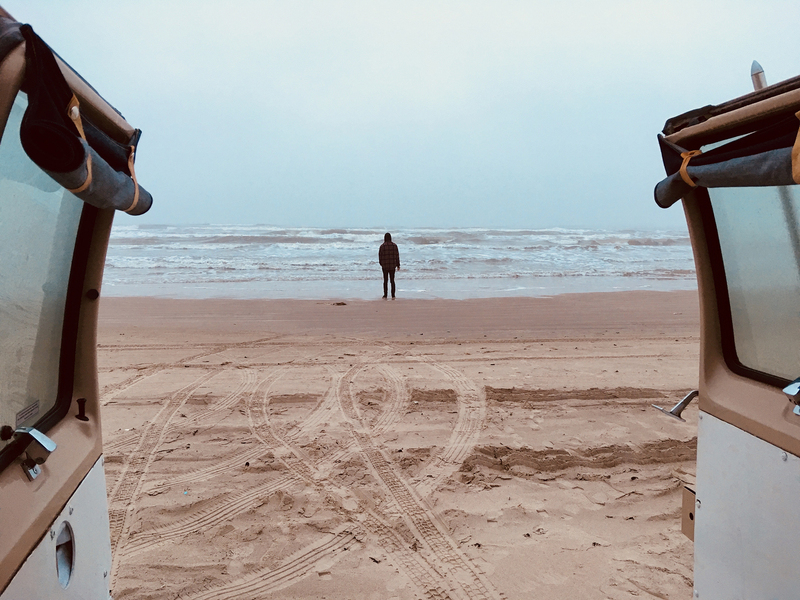 On a lovely grey day, we made our way down toward Corpus Christi to do some beach camping on Padre Island. We would have loved to go all the way to South Padre, which is right on the Mexican border, but it was a little out of the way and we weren’t convinced that the heavy rainclouds would magically transform into clear blue skies just a couple hours down the coast. Weather aside, it was super rad to be able to drive right onto the sand and set up shop. The park ranger told us that the first 5 miles of the beach are hard-packed sand that’s easy enough for any vehicle to drive on, whereas after the 5 mile marker, things get a little softer and 4×4 is probably wise. I’m sure the distant miles of the beach are quiet and secluded but Clementine doesn’t have the best track record with driving through soft sand. The next day promised warmer temperatures and a clear sky but in the time we got to the beach and lost cell service, the weather forecast must have changed significantly because all the day brought was fog so thick you could cut it with a knife. In fact, the fog was so damp that after sitting outside for a couple hours, we were soaking wet. It was hilarious to have to dry your hair with a towel when it wasn’t even raining – you could see the fog travelling through the air like thick clouds at eye level. Despite being such a blah day, there was a lot of traffic passing by our spot with all varieties of vehicles looking for a place to camp, or perhaps ambitiously thinking the fog might clear if they just trekked on a little further. It created a very mystical backdrop for the day’s activity since cars only came into view when they were about 250 metres away; it seemed as if at any moment, the Black Pearl would approach the shore to steal all of our rations. 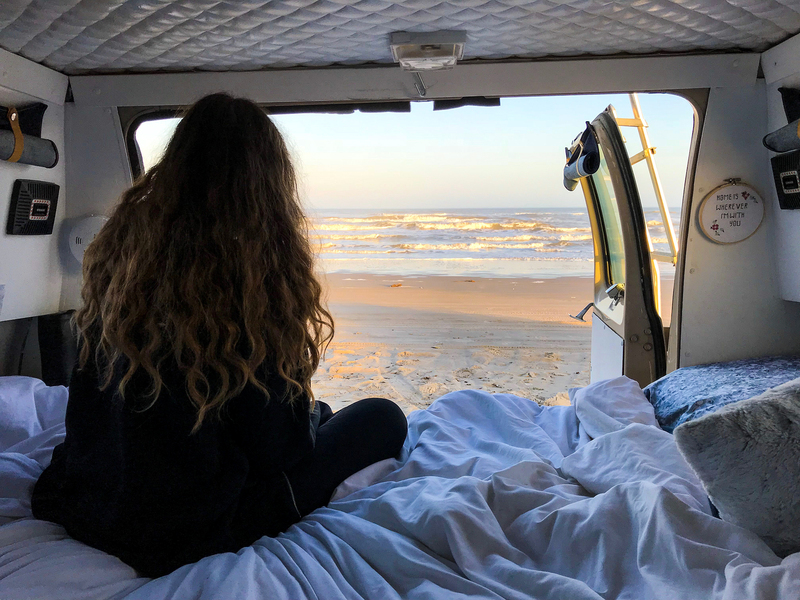 We stayed two nights on Padre Island before giving Clemmie a much needed bath and moving onto the next beach (get a car wash after staying on the island. The salty air creates such a thick film on the windows and body that becomes a rust magnet. Even if you don’t feel like it, just do it). Our drive took us back through Corpus and seemingly every oil refinery in Texas. It’s not exactly the nicest view to look out on from your million dollar beach home but a nice waterside drive nonetheless. Another landscape this drive brought us through was the heart-wrenching state of Port Aransas and its surrounding areas. With Hurricane Harvey only a few months behind us, the debris and remnants of very tough times were still quite apparent. We first saw a bunch of collapsed trees and fences and thought that was bad until we reached the “heavy debris area” where the city had created landfills essentially in the area between the split highway. Mountains of furniture, clothing and building materials were piled one after the other. Looking at this stuff was like looking at parts of peoples’ lives destroyed and accumulated with no hope of being salvaged. 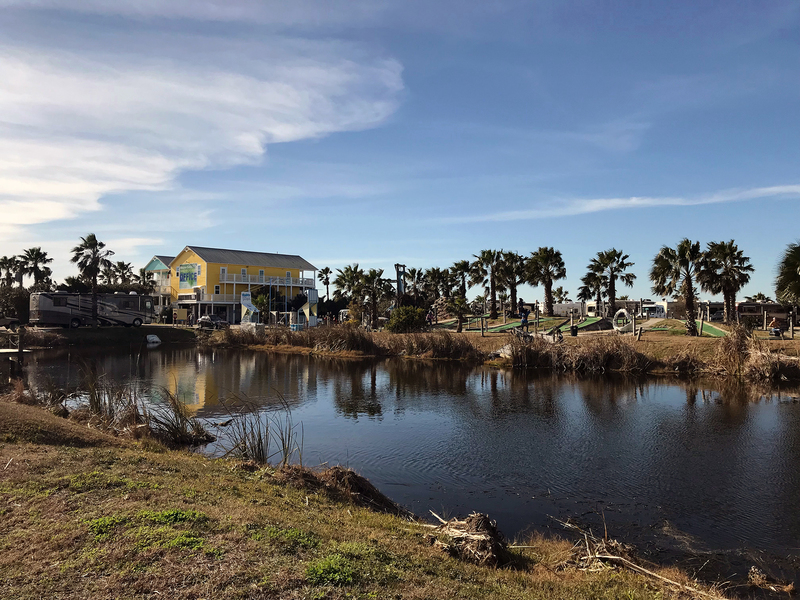 It was clear that relief efforts were slowly helping to rebuild local businesses and homes but it was shocking to see the state of this part of the coast some four months after the hurricane while fancy beach homes and chain restaurants closer to Corpus showed no signs of damage. I think that instead of avoiding these areas, we should be encouraged to visit them and support the local businesses so they can get back on their feet. Our next stop yielded harder sand and calmer waters. Magnolia Beach is situated in Lavaca Bay so worries of the tide coming up to the van in the middle of the night were non-existent in comparison to the rough waters at Padre. 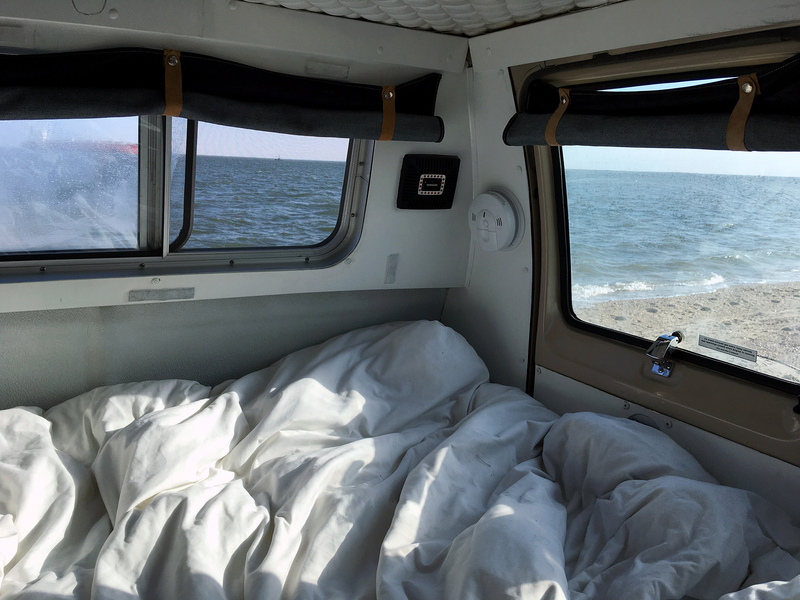 With a thunderstorm looming, the air was warm and humid and left us with perfect sleeping temperatures and a mellow soundtrack of calm waves hitting the shore. We were parked about 2 feet away from the water and couldn’t have asked for a better spot. 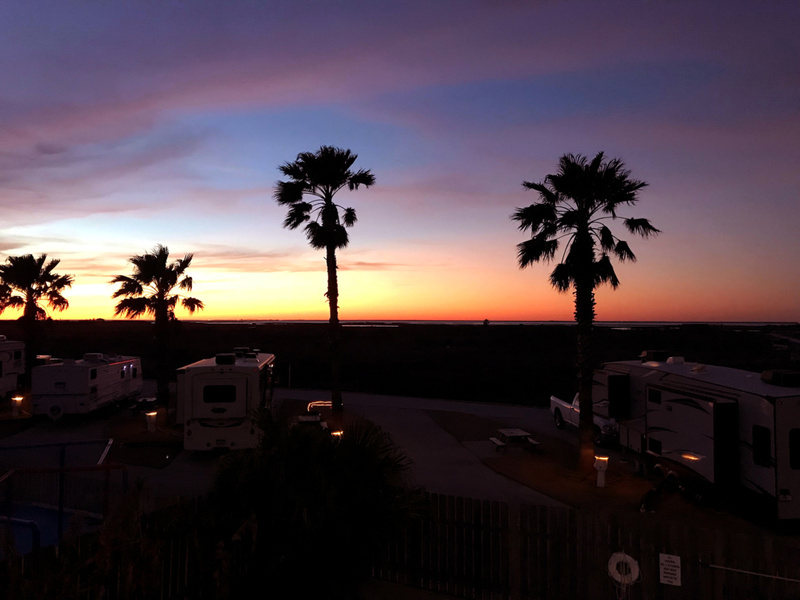 The beach is a shell beach so it’s easy to drive on and there were even some big rigs parked further down – an A+ spot to check out if you’re in South Texas. Further down the coast, we took the Bluewater Highway from Surfside Beach to Galveston. There’s a $2 fee to use the San Luis Pass that connects the lower island to Galveston Island but it was well worth it for us to cut down on the driving time and to give us a much more scenic journey. Said scenery also made one thing quite clear: this is rich people territory. 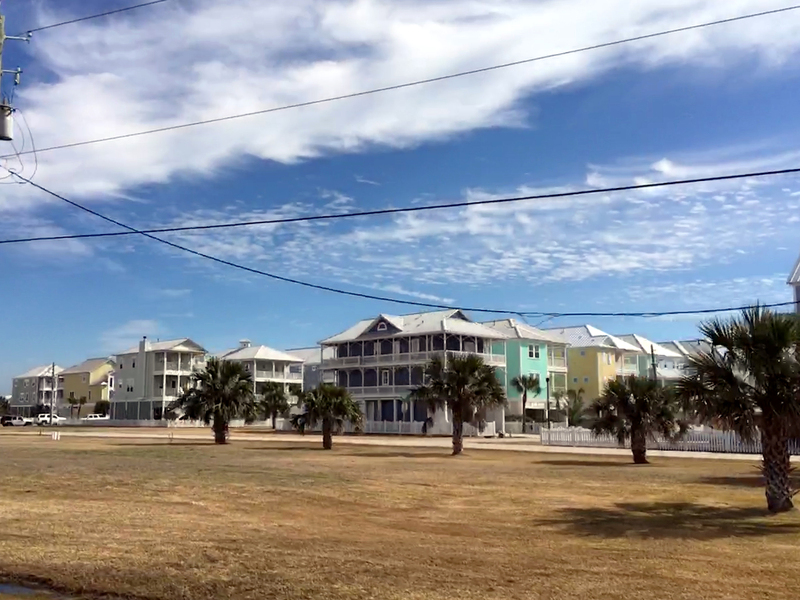 Colourful beach houses on stilts lined both sides of the road with towering palm trees and perfectly manicured lawns. From what I’m used to in Toronto, homes that big would generally be 2 or 3 separate apartments but Justin reminded me that these were single family homes. And not just homes, vacation homes. Because why not have a mini-putt beside your pond? We stayed in Jamaica Beach, about 20 minutes away from the town of Galveston. As lovely as the area was, it was an abnormally cold week yet again so we didn’t get a chance to do much outdoors. 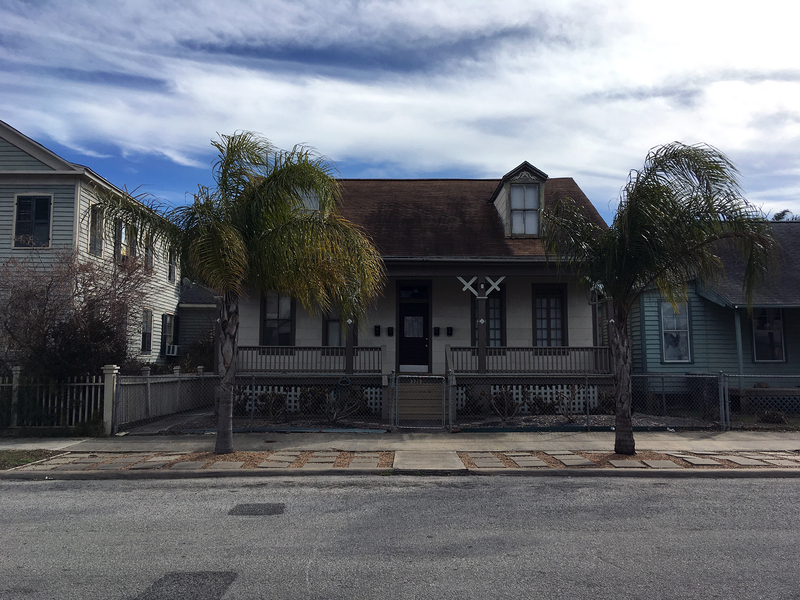 We went into downtown Galveston on our way out and grabbed our share of the golden food group at one of the many deep-fried seafood joints before scoping out what I was most excited for, serial killer Robert Durst’s house!! He lived in Galveston for a little while, disguised as a mute old woman, before slaughtering his neighbour and throwing his remains into Galveston Bay. Now that’s a tourist attraction! If you’re into true crime then…this probably still isn’t worth the stop since someone seems to live here and either isn’t bothered by it or got a really good deal from their real estate agent. To leave Galveston, we took the free ferry to the Bolivar Peninsula. 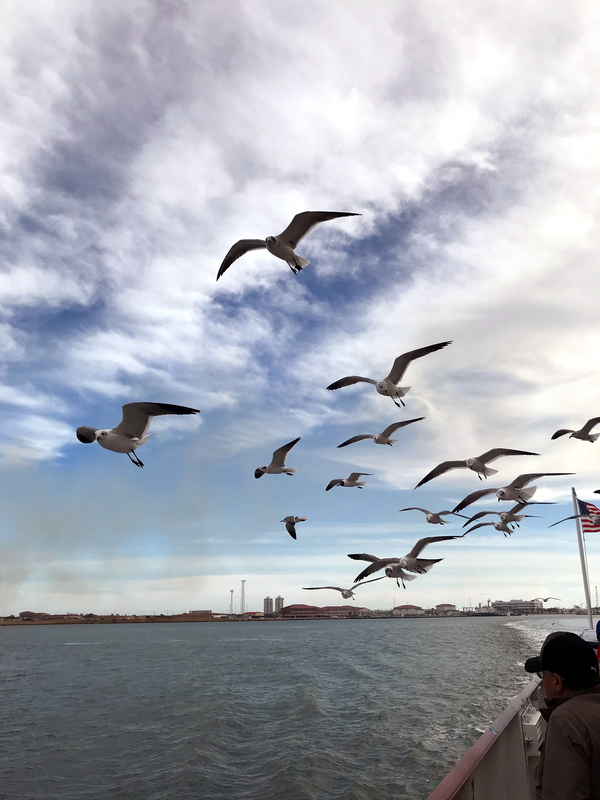 This is about a 20 minute ride across Galveston Bay where you can either stay in your car or step outside to let the wind blow through your hair and the seagulls fly alarmingly close to your head. The lady beside us was throwing Ritz crackers at them so they continuously hovered along the edge of the boat, just plotting whom they were going to poop on. Luckily we made it out untarnished and continued on about 10 minutes down the road to the Bolivar Flats. This is a mud flats meets beach area with a designated zone that you can camp for free in. From the highway, you’ll turn down Rettilon Road and see a big ol’ sign welcoming you to the beach at the end of the road. It’s full of confusing rules and arrows pointing in misleading directions so if you find yourself standing there a bit confused like we did, stand looking at the sign and everything to the left of it until the wash is free reign. To the right of the sign and past the wash requires a permit that’s like 10 bucks and lasts you a week. 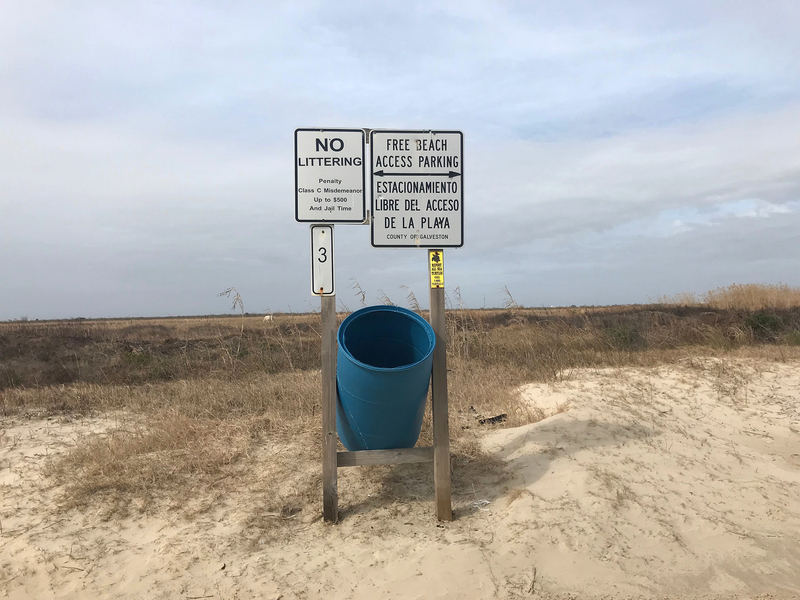 There appeared to be virtually no difference in beach quality and both sides have access to a portapotty and garbage bins, which is pretty handy. Sadly, the winds picked up and the temperature seemed to plummet when we got there so we stayed inside but we certainly could not complain when the Gulf of Mexico was in our backyard. Despite not having very beachy weather, we had a wicked time driving and camping along Texas’ Gulf Coast. It was nice to do this in the off-season because I’m sure it gets pretty busy down there in the summer. What’s your favourite third coast spot?